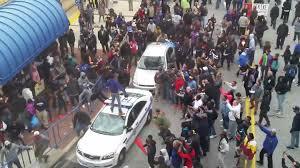 You have probably heard that there were riots in Baltimore last night and too many fires that lit up the night. In the midst of the violence many Baltimore residents took to the streets to try to calm the city and area clergy walk with them. This morning, in an interview with one of the pastors, he said that Crypt and Blood gang members walked and prayed with them as well. Jesus’ concern for Jerusalem has been running through my head. Jesus loved the city, as all Jews did, yet he saw the unwillingness to address real issues that face them. (Of course the writer of the gospel of Luke has experienced the siege and destruction of Jerusalem). It is a recurring theme throughout history. Our cities hold the diversity and injustice of who we are as God’s people in this world. The richest have the select home near the harbor with a beautiful view and the poorest have broken concrete and decaying building as their only view. In Luke 19, Jesus expresses his pain over his city. One of the effects of last night’s riot was that the Orioles baseball game was cancelled. Many of you know that I love the Orioles, not just because they play great baseball, but because of their leadership. John Angelos’ comments on the riots is not exception to the greatest of the Orioles organization. My Celebration of Discipline group met yesterday to talk about Solitude. I really was a good discussion, although we began by agreeing that an afternoon nap might be more helpful. I was reminded how little time we spend in quite before the Divine. This is different than meditation. I think in meditation we try focus our minds; intentional moving towards a link with God. I think in solitude we just sit – almost like sitting with an empty bucket and waiting for God to fill it. In solitude we are completely relaxed, not yearning for anything, just waiting. It is a very restful discipline. The video we watched pointed out that it is this discipline where all the others arise. Until we are silent before God, seek solitude with the Divine, we can not discern where God is leading us in our spiritual life. I enjoy solitude. It has helped me to not be anxious, be relaxed in the present moment, not need to defend myself or my decision. It help me to find that holy leisure. Here’s to a day of being silent before the Eternal Divine in solitude, waiting for our empty bucket to be filled by God. I really think this empty bucket is better than a bucket list. I really like blogging, although I hate the disciple of sitting down to write. Yet, when I sit down to blog and read the text for the day, I often read it from another angle. I think it is clear that the purpose of Jesus’ journey was to proclaim the Good News (God’s kingdom is near). To let all who could heart that God was present and caring and ready to forgive and welcome all people. Because of his compassion, when he encountered “broken” people along the way, he would heal them. Since the means of communication was limited he had to walk from town to town to get his message out. At one point in the gospels one of his disciples says, “why don’t you stay in one place and we will bring those who need healing to you.” As always with the disciples, he missed the point. Since Jesus compassion prompted him to tell he disciple that the harvest was plentiful, he seems as through he wanted us; all of us to be about his work; Teaching, Preaching. and see if healing become our byproduct. Maybe we should try that for awhile. I like the Christian faith because, at its best, we talk about real things: Life and Death, Blessings and Curse: Choices we are given; and the hope of transformation in this life and in the life after this one. In the text today, although Simon the Cyrene is compelled to carry Jesus’ cross (he was so beaten he could not carry it), Jesus dies alone on that Cross. I think the feeling of isolation in death is felt through Jesus’ cry on the cross, “My God, my God, why have you forsaken me”. There is a lot of writing on this sentence and certainly it is the text from Psalm 22, but I think it also reflects the reality of aloneness in death. I was the last family member to be with Dad before he died. He was so sick at the end, his breathing was long and labored, I also sensed a fear in him of the unknown. As much as I wanted to make everything OK for Dad, he had to travel the last leg on his own – as we all will. Solitude. 32 As they went out, they came upon a man from Cyrene named Simon; they compelled this man to carry his cross. 33 And when they came to a place called Golgotha (which means Place of a Skull), 34 they offered him wine to drink, mixed with gall; but when he tasted it, he would not drink it. 35 And when they had crucified him, they divided his clothes among themselves by casting lots;36 then they sat down there and kept watch over him. The description of Jesus in the garden of Gethsemane has always touched my heart and raised questions in my mind. One question was whether events of Thursday night and Good Friday would have changed if the disciple could have stayed awake while Jesus prayed. This morning, while thinking about solitude, I think about the support Jesus would have gained if disciple could have prayed for him that night. I know in my life I have had friends praying for me during difficult time and it has been a wonderful source of support. I think it is good lesson that when Jesus knew life was getting harder, he wanted to be alone to pray and he wanted his friends praying for him. Have you ever thought about that? Who prayed for Jesus and his ministry? The reading for today is one of my favorites. It is from the prophet Jeremiah and speaks to his emotions at having to be a prophet for God. I even did a paper on this passage while I was in seminary. One of the translations of the text uses the word seduced instead of enticed. I like that translation better, I guess because it resonates with me. 10 For I hear many whispering: “Terror is all around! All my close friends are watching for me to stumble. therefore my persecutors will stumble, and they will not prevail. They will be greatly shamed, for they will not succeed. Their eternal dishonor will never be forgotten. 13 Sing to the Lord; praise the Lord! 14 Cursed be the day on which I was born! I like being older. I think there is a real gift in living to the point where you know what is important and what is not. I am less likely to get upset about stuff that use to upset me. There is a quietness that comes from journeying with the Divine Presence. I have met people are who anxious in their prayers. Actually, I think they are just really worrying and part of their routine is to ‘talk to God about it.’ My experience of these people is they are not really surrendering their concerns to God and they are not really waiting on God’s leading, they are just trying to turn their worry into a religious activity. It is an external attempt to create an inward reality, but I think it fails. On Saturday I went on a motorcycle ride in memory of a young man who was killed by a drunk driver. Now, I didn’t actually ride a motorcycle, but I did ride in a mustang convertible. It was really cool. The day was absolutely beautiful. The sun was shinning, not to hot, trees and flower were in blossom and everything was so green. Psalm 8 came to mind.